An artist’s concept of NASA's Wide-field Infrared Survey Explorer (WISE) spacecraft. NASA's new cosmic mapper successfully jettisoned a protective lens cover lastweek, opening its infrared eyes to Universe for an unprecedented survey in2010. A United Launch AllianceDelta 2 rocket delivered the Wide-fieldInfrared Survey Explorer spacecraft into polar orbit from Vandenberg AirForce Base in California on December 14. The cover was secured atopthe Thermos-like bottle structure that holds the observatory'stelescope and state-of-the-art detectors in super-cold frozen hydrogen. Thecap was designed to keep out light during the early days of the mission whilecontrollers ensured the spacecraft's orientation system would operatecorrectly, preventing an accidental blinding by looking at the sun or down atEarth. The one-month checkout andpreparatory period for the observatory achieved its key milestonewhen the cover was commanded to separate at about 5:30 p.m. EST (2230 GMT). Pyrotechnicdevices fired to release nuts holding the cover in place, thenthree springs ejected the small structure away from WISE and into a lowerorbit. "The cover floatedaway as we planned," said William Irace, theWISE project manager at NASA's Jet Propulsion Laboratory. "Our detectorsare soaking up starlight for the first time." Upcoming on the agenda formission control will be the tweaking of relative motions between the spacecraftitself and the internal scanning mirror that willenable "freeze-frame" snapshots to be taken of the sky every 11seconds as WISE circles the planet. "It's wonderful to endthe year with open WISE eyes," said Peter Eisenhardt,the mission's project scientist at JPL. "Now we can synch WISE up to ourscan mirror and get on with the business of exploring the infraredUniverse." The mapping project shouldstart in mid-January, with the first public release of WISE imagery expected inmid-February. 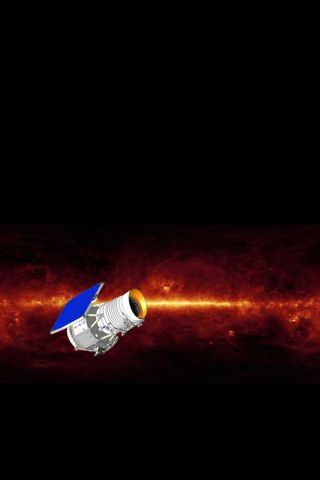 WISE will have a scant ninemonths to perform its full-sky survey before the solid hydrogen that's neededto keep its infrared optics cold is gone. The mission promises todiscover millions of objects never seen before, writing an authoritative newatlas that will be referenced by space- and ground-based observatories forcountless years to come. The infrared nature of WISEallows the craft observe the heat emitted from unknown objects either hiddenbehind dusty veils or impossible to see in visible light. The telescope will becapable of imaging the glow from targets ranging in temperature from -330degrees F to 1,300 degrees F.
Scientists expect to findseveral hundred asteroids that pass close to Earth, failed stars in our solarsystem's backyard and ultraluminous galaxies wherenew stars are being created at astonishing rates, all of which will be revealedto humans for the first thanks to WISE.